Looking for some fun freebies in your mailbox? Here a couple great FREE magazines you can get, hassle FREE! 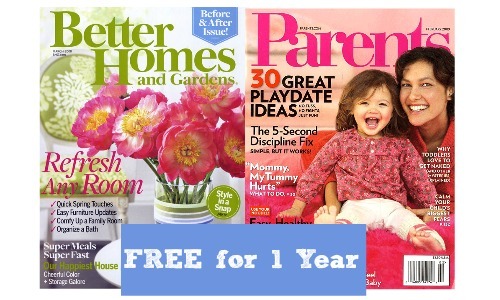 Get a FREE year of Parents magazine when you answer this short survey. You can also receive a FREE year-long subscription to Better Homes and Gardens if you’d rather have that magazine. These magazine offers are totally FREE and you’ll never receive a bill.